I'm just going to put the link to the video, because, while the song is nice, the video is a lot of stop-motion videography, and well, it's rather irritating. And I think there was something going around back in the day that it could induce photo-sensitive epileptic seizures by watching it. Personally, I had it running in another tab while I did something else, so I could hear the tune, but not have to watch the video portion. In any case, go HERE to listen/view. Come to the Twitter chat! Oh people come and chat with us! 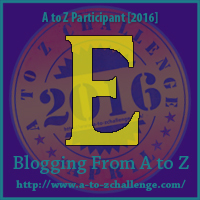 Chat A to Z tonight. Fill up your cup and take a drink! YEs! And while we're chatting, let's eat some cheese, eh? See you at the chat tonight!